Leading Manufacturer of Epic or, Microsoft Dynamics CRM, Business Intelligence, Enterprise Resource Planning, Financial And Controlling and Human Resource Management from Ahmedabad. Corporate Serve offers to license and implement Epicor 9, a cutting edge technology product of Epicor Software Corporation of USA. Epicor 9 is placed in the 'Visionary' section of Gartner’s Magic Quadrant (MQ) for ERP for Product-Centric Midmarket Companies. Epicor Software is a global leader in delivering business software solutions to the manufacturing, distribution, retail, hospitality and services industries. With 20,000 customers in over 150 countries, Epicor provides integrated enterprise resource planning (ERP), customer relationship management (CRM), supply chain management (SCM), human capital management (HCM) and enterprise retail software solutions that enable companies to drive increased efficiency and improve profitability. 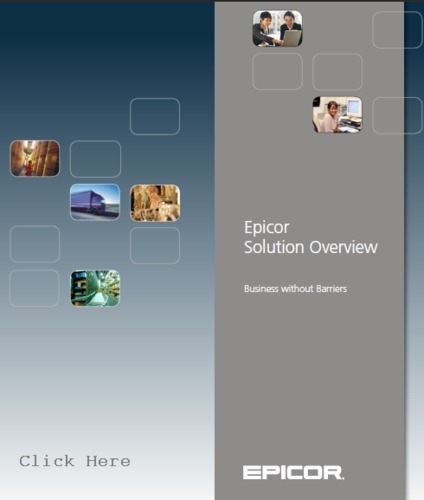 Employing innovative service-oriented architecture (SOA) and Web services technology, Epicor offers end-to-end, industry-specific enterprise software solution for manufacturing, distribution, services, retail, and hospitality that enable companies to increase efficiencies, improve performance, and build competitive advantage. Epicor 9 has deep footprint of functionalities clubbed with the cutting edge technology to use them. It covers all functional areas needed by modern day organizations. The solution offers all functionalities out of box. with microsoft dynamics crm online, you get the same powerful crm software delivered as a cloud service from microsoft, enabling instant-on anywhere access, predictable pay as you go pricing, and a financially backed service level agreement (sla). Deliver on the power of productivity with a crm solution that is: • familiar—software that empowers people through natural, productive, and insightful experiences. • intelligent—real-time analytics and streamlined business processes that enable informed decisions and operational efficiencies. • connected—connections across people, processes, and ecosystems that allow businesses to maximize the value of relationships and systems. maximize marketing spend improve your organization's marketing effectiveness with microsoft dynamics crm. Provide your marketing professionals with flexible segmentation tools, simplified campaign management capabilities, intuitive response tracking, and insightful analytics to improve your marketing effectiveness. win more deals spend more time on selling and less time on administrative tasks with microsoft dynamics crm. Take advantage of full lead to cash visibility, lead and opportunity tracking, streamlined approvals, and real-time sales forecasts to drive increased sales output and higher close rates. delight customers provide compelling customer service experiences that build customer loyalty with microsoft dynamics crm. Empower your people with tools that simplify case management, streamline escalations, improve knowledge sharing, and enable more effective account management, all while helping to contain service costs. optimize all relationships use the inherent flexibility and extensibility of microsoft dynamics crm to maximize the value of all relationships. Quickly create custom business applications and industry solutions without compromising on capabilities, budget, or delivery time right from within microsoft dynamics crm. It is common for managements to feel that they have ensured a lot of data being input in the IT systems but nothing meaningful has come out. Even after implementing sound ERP systems still use excels as a tool for analysing data from ERP solution or from multiple sources of databases. Challenge is to convert large amount of 'data' into meaningful 'information'. Team of CorporateServe helps organisations to impellent BI solution configured according to requirements of each management role in the organisation. Experts of CorporateServe has immense experience in analysing the needs and providing BI solutions to several roles in organisations such as CEO, CFO, CXO, CMO, Head Supply Chain, Head Human Resources, Managers of different functions. Solution provided is based on specific needs of each organisation and teh output formats can be any such as online dashboards, SMS alerts, email alerts, pop up messages, excel conversions, html reports, etc. Investment in a BI solution gives fastest return on investment to an organisation that has invested in putting other IT systems in place as incremental cost in investing in a BI solution is much lower than the incremental benefits from a BI solution. enterprise resource planning (erp) systems integrate internal and external management information across entire organization, embracing finance & accounting, inventories, manufacturing, sales and distribution channels, services, customer relationship management, and human resources. erp systems offer benefits of integrated environment for multi user, multi locations, multi company and multi currency transactions. Erp systems help not only transaction capturing but also enable planning according to pre-set rules and configurations. In modern days of increased scalabilty of operations it has become imperative to institute stringent internal controls and comply with laws including soa. Erp systems make this happen with ease. Erp systems can run on a variety of hardware and network configurations, typically employing a database as a repository for information. Erp systems connect employees, customers and vendors and management together. in the dark ages of financial management software there were only spreadsheets, prone to corruption. Today, there is a wide range of tools within erp for financial management. Instituting internal controls has become important part of financial management. Apart from this controlling has become an important function in and around financial management. All of this becomes easy to manage with erp system. general ledger is at the core of any erp financial management system, which encompasses the functions that are required to maintain one or more sets of books, generate financial reports, manage cash and fixed assets and execute payment and receivable transactions. Everything starts by having a general ledger and then it works its way out to accounts payables and accounts receivables. Human resource is invariably the most important resource in any commercial organization. Considering the dynamic nature of organizations these days, it has become extremely important to have a proper human resource management solution. Since materials accounts for half or more of total cost of the product and offer considerable scope for improving profit for an organization, the material management functions assume greater significance in today's cut throat competition that exist in the market for manufacturing and trading industries. Materials Management is related to planning, procuring, storing and providing the appropriate material of right quality, right quantity at right place in right time so as to co-ordinate and schedule the production activity in an integrative way for an industrial undertaking. This is only possible by efficient materials management. CorporateServe helps organizations manage material management functions optimally and improving efficiencies by implementing the following components. CorporateServe employs a team of engineers from different streams such as mechanical, electrical and, chemicals and textiles engineering. Engineers of CorporateServe come with domain experience of working with several manufacturing organizations. Engineers of CorporateServe work together with a team of technical programmers to suitably design and implement ERP solution for manufacturing organizations. CorporateServe has successfully deployed ERP solutions at several multi product, multi location complex manufacturing organizations. Elegant supply chains are the key to flourishing in a competitive marketplace. CorporateServe can help you get products to market faster, saving time and cost with SCM implementations. Opportunity assessment begins with technology evaluation, to evaluate and choose the right technologies to be implemented. Process mapping comes next, to conclude the degree of the re-engineering effort required, and the spots where systems should be implemented to streamline the process. ROI estimations follow to help evaluate options. Building patterns to address process blockages, getting better business processes and lowering TCO. It's optimization engines and visualization components, enables us to build custom applications for client-specific planning, scheduling and optimization needs. With our Onshore™ model for global release, CorporateServe sets up global teams that flawlessly deliver ongoing maintenance and support for supply-chain applications. We understand that the Key characteristics of LSP (Logistics Service Provider) and Transportation industries (Road and Rail ) are Contract and pricing mechanism, pressure on costs, high working capital, huge document processing, Consignment tracking, Profitability dimensions like consignment & contract and MIS. FTL, Multimodal logistics, Rail freight forwarding, over dimension cargo, ocean freight and air freight management, Custom clearance services, owned train, parcel vans, shared train operation are logistics related operations that are covered in the solution. CorporateServe has covered these important business functions in SAP A1 solution to enable your company manage the entire business better using Material Management (MM), Sales & Distribution (SD), Finance & Controlling (FICO), Plant Maintenance (PM) and HCM. A good Business Process management (BPM) solution will help seamlessly integrate the different business processes running in different systems in your organization into one flawless system. CorporateServe's BPM is a systematic approach that will help you standardize and optimize the operational processes to reduce costs, improve quality, and increase agility. As a technology, BPM provides organizations with a framework of tools to design, model, implement, run, monitor, operate, and improve business processes flexibly across their life cycle. As an organization, you need to manage the processes at three levels- Enterprise level, Process level and Technology level. The CorporateServe's Project Management Services will help your organization manage its business processes better. CorporateServe uses Business Workflow to design better business processes and ensure that all the processes function like clockwork. Our Workflow process involves designing, planning and implementing workflow solutions with goal of quality, reusability, reduced Total Cost of Ownership (TCO), and reduced time-to market. We offer three types of workflows depending on the business function. Pre-defined workflows are best suited to simple, collaborative business processes, SharePoint Designer workflows are well-suited for structured, sequential processes such as asset tracking, service requests etc., while Visual Studio workflows are ideal for complex, structured business processes that require code, such as purchase order processing and fulfilment. CorporateServe 'simplementation services have been built on several successful end to end implementations across industries. Over the last decade, as one of the services partners, Corporateserve brings together rich implementation skills across the entire portfolio solutions, Core ERP, BI, SRM, CRM, Portal etc. The CorporateServe team addresses emerging industry demand for enterprise-level applications through the Netweaver or the SharePoint platforms.CorporateServe has created a unique development, configuration and consulting team with expertise in these technologies. CorporateServe's Process integration application Process Integration (PI), formerly called Exchange Infrastructure ( XI), is enterprise application integration (EAI) software, a component of the NetWeaver product group used for the exchange of information among a company's internal software and systems and those of external parties. Our Enterprise Application Services portfolio assists organizations, such as yours, in your business transformation initiatives. Services that will help you align with your strategic business objectives, enhance productivity, reduce Total Cost of Ownership (TCO) and increase ROI. The focus is on leveraging our set of services using technology to maximize the benefits our services extend to the organization: from intellectual capital,to meeting regulatory requirements and to improving business relationships with clients . We have a skilled and dedicated quality assurance team to ensure that quality standards are followed in programming and documentation. We have well-defined technology and business processes in place that are defined and refined by our experts and are validated against industry best practices. Development requirements of customers can be handled onsite at customer location or offsite based out of CorporateServe's development centre at Bangalore. Corporateserve is equipped with a Bangalore-based dedicated development team which handles all the offsite developments of overseas and Indian customers. We understand the importance of balancing the quality of packaged ERP solutions with the flexibility that ERP implementation provides. CorporateServe has the necessary expertise to seamlessly integrate applications across disparate platforms and technologies. Our partnership with parent organisations has helped us build distinctive and functional competencies that can deliver unique competitive advantages to the customer's enterprise. We support customers across the entire range of the application life cycle, from package evaluation through implementation to post implementation support.CorporateServe implements ERP solutions for professional services and retail companies end-to end. corporate serve recognizes that rep systems in companies are mission critical and form the lifeline for crucial business operations and decision making. Corporate serve's support services are built around the philosophy that the customer' serp system is available always on demand. The users get reliable and informative support as required. Corporate serve's support services are also aligned to proactively anticipate customer requirements so that the system can be intelligently and quickly tailored to meet the dynamic and ever changing business requirements. once an it solution is in place, you need to continuously improve your it solution landscape and optimize all your business-related processes for enhanced performance. Our robust support services are offer support, continuous improvement of erp solution-based landscapes and optimization of all business related processes. We can help you strengthen your competitive position by reducing cost of ownership while improving business performance. We have extended our services around erp products and solutions to provide organizations such as yours, the ability to benefit from our profound erp expertise and efficient delivery capabilities. Our expertise touches across verticals be it: manufacturing, retail, finance, it and we deliver tailor-made solutions that fits your industry profile as well as your business requirement. We also offer an sla based model that incorporates proven methodologies and best practices to enable continuous infrastructure support services at optimum costs. erp administration:corporateserve offers erpbasis consulting and support for sap and other erp administration infrastructure services to our customers. Our erpadmin practice utilizes high quality and cost-effective consulting services. We provide client advisory services during system installations and implementations. The portfolio of admin services includes project implementations, upgrades, migrations, support and expert consulting for major production system issues. sap solution manager: we offer standard erp solution manager functionality which enables you to be connected with erp's service and support infrastructure. Erp solution manager (solman) is erp's unique application management solution that facilitates technical support for distributed systems. The solman functionality provides support in solution deployment, operations and enables continuous improvement of processes and systems. Erpupgrades:corporateserve's erp upgrade brings together proven methodology and experience in upgrading the erp. Theerp upgrades begin with an appraisal of the landscape present in your organization. Reappraisal of the current landscape ensures that it is aligned with your organization's strategic roadmap. erp application management services: our erp application management services are offered for support, continuous improvement of erp solution-based landscapes and to optimize all business related processes. We work towards helping you strengthen your competitive position by reducing cost of ownership while improving business performance. Corporateserve's ams is the solution to support an organization in operating, optimizing and extending its application landscape. erp roll-out and migration: global organizations with erp as their business platform, when setting up operations in india, would require their erp system to be extended to cover indian operations. This calls for an in-depth understanding of indian systems, particularly those relating to business practices relevant to india, their interface with global systems, local taxation requirements etc. , implementing the system and leading the organization through change. In 2002 Microsoft bought Navision A/S and the new division in Microsoft was named Microsoft Business Solutions and also included Microsoft CRM. In September 2005, Microsoft rebranded the product and re-released it as Microsoft Dynamics NAV. In December 2008 Microsoft Dynamics NAV 2009 released, which contains both the original "classic" client, as well as a new three-tier GUI called the RoleTailored Client (RTC). Microsoft Dynamics ERP system is available with new role based user interface, SQL based reporting and analysis, SharePoint based portal, Pocket PC based mobile clients and integration with Microsoft Office. CorporateServe being Microsoft Dynamcis ERP Gold Competency complied company, has expertise to deploy Microsoft Dynamics NAV solutions. CorporateServe has successfully deployed Microsoft Dynamics NAV at 100+ sites including at education, publishing, manufacturing, distribution, and retail organizations. CorporateServe is a Premier & award winning Sales & Implementation Partner to Microsoft Dynamics for all the current offerings in India. The team at CorporateServe has vast experience and expertise of Microsoft Dynamics ERP solutioning and implementation in varied industries. SAP Business All In One remedies are sector distinct business useful resource arranging solutions available to midsize or emerging businesses. Each and every SAP Organization All-in-One single answer is built on SAP Best Methods packages that deliver a confirmed implementation methodology, documentation, and pre-configuration. Comprehensive pre-configuration settings that enable you operate software with nominal installation effort In depth reusable documentation that one can use for self-review, analysis, and undertaking team and stop-user training A crystal clear implementation methodology based mostly on a logical step-by-step method. SAP Finest Techniques gives a reliable basis for SAP Enterprise All-in-One particular, enabling you to implement a advanced remedy in a fraction of the time typically necessary and at a predictable, affordable price. CorporateServe delivers SAP Business All In One particular solutions for the following industries. With ERP software, many businesses have become very good at gathering and imputing data. ERP software makes it easy to manage all of an organization's data using one business software tool rather than multiple separate applications that lack interoperability. This is the strength of ERP, and many businesses have spent a great deal of money on ERP solutions, hoping they would bring forth the end of their worries. The reality, however, is that while most ERP solutions gather the data, they do not provide adequate analysis of it, which is often referred to as business intelligence. How useful is it to have a plenitude of information with no practical way to access it and analyze it? Furthermore, many companies have legacy data left over from previous applications, prior to their ERP implementation. Unless they spent the money to have it all migrated, that data is just sitting. For such situations, businesses need data warehousing. Remember, the data itself is there. You know it is because you or someone working with you put it there. The problem that needs solving is how to effectively glean the useful information you need and synthesize seemingly fragmented information into useful knowledge. Software will not entirely do this for you, but it can make the process a little less daunting. Microsoft Dynamics increases visibility and improves insight at all levels of your business, making you confident that the right decisions are being made by the right people in your organization. • Use Business Analyzer to get the information most important to your business. Drill down to get more detail, create tasks, or delegate to others as needed. • Make smart decisions with notifications and alerts, automated approval routings, and controls that provide checks and balances on your processes. • Go beyond basic accounting and financial management with analytics tools that can help you be more proactive, identify opportunities and problems fast, and take quick action. See how Microsoft Dynamics is helping customers gain greater control. Make smarter decisions to improve your operating margins—and your cash flow. Microsoft Dynamics helps you maximize profitability by getting the most out of your people and systems. Optimize buying and inventory management with improved automation and efficiency across your key business processes. Manage your sales process from start to finish. Identify your top customers to spot new sales opportunities and focus on your most profitable products and services. Adapt Microsoft Dynamics quickly and without complicated or costly development work. Grow your business knowing that your systems will scale to match your ambition. See how Microsoft Dynamics is helping customers drive growth. For the past few years, ERP systems have become one of the most powerful tools for quality control management. The important characteristics of quality control management include customer-driven quality, top management leadership and commitment, continuous improvement, fast response, actions based on facts, employee participation and a quality management culture. For CorporateServe, the main objectives of the quality control module are the construction and maintenance of the filing of the quality control. The control of reception, internal rejections, clients, claims, providers and evaluations of the same corrective actions are related to their follow-up, and are also some of the goals that this module offers. Furthermore, it is also helpful for internal auditory procedures and for the control of auditory providers. • accurate analysis of rejection, rework etc. corporateserve automates various business processes in a publishing company and provides and integrated industry specific solution. We understand that the Key characteristics of Ceramic and Sanitary industries are title costing, multiple SKUs management, quality controls, batch management, supply chain efficiency , pricing controls, discounts engines and product profitability MIS. CorporateServe has covered these important business functions in SAP A1 solution to enable your company manage the entire business better using Production Planning (PP) , Material Management (MM), Sales & Distribution (SD), Finance & Controlling (FICO), Quality Management ( QM) Plant Maintenance (PM) and HCM. • Set planning horizons to suit your dynamic business needs. • Automatic planning of purchases, production orders, Sub-contracting and Capacities. • More processes like Casting, Greenhouse, Glazing, Placing, and Kiln in & out entries, Once-fire sorting, Re-fire sorting and Packaging are all covered. The chemicals industry includes companies involved in the production of chemicals with high economic impact. These include polymers, petrochemicals, agrochemicals, paints, pharmaceuticals and other chemicals. Chemical processes are used, including chemical reactions to form new substances, separations based on properties such as solubility or ionic charge and distillations and transformations by heating and other methods. The integrated solution offered by CorporateServe covers secondary sales and sales force management in an integrated manner within the ERP solution. Consultants of CorporateServe add significant value while implementing ERP at these industries. Microsoft Dynamics ERP gives you the flexibility to all aspects of your dairy operations. DairySoft™ is developed on Microsoft Dynamics NAV (Navision 2009) which is globally one of the most popular ERP systems. Functionally it covers finance, accounts, milk procurement, materials management, inventory, shelf life management, quality, processing, packing, sales, distribution, human resource, payroll, customer relationship management, etc. The Microsoft Dynamics ERP solutions are scalable from small and medium to very large dairy organisation. Indian localisation of the solution is available and provided by Microsoft. DairySoft™ offers all transactional and planning functionalities needed by dairy industry. These include title corporate functions, financial accounting, budgeting, milk procurement, village level centres for milk collection, gates at plants, quality labs, production and packing, stores and inventory, dispatch, sales and marketing, exports, HRM, Job works (for large companies). This vertical is developed by CorporateServe which is certified by Microsoft as its partner for Dynamics solutions. Dairy, etc. The ERP system has been developed by experts having vast experience of operations of renowned companies such as Gopaljee and Param. CorporateServe is a Gold Certified partner of Microsoft Dynamics and has also attained Gold ERP Competency. CorporateServe has gained special expertise in implementing Dairy Vertical on Microsoft Dynamics NAV ERP in several dairy organisations and has understood the pain areas that need to be addressed and found solutions for these through Dairy Vertical on Microsoft Dynamics. The Dairy Vertical solution is provided all over world by CorporateServe, in Microsoft Dynamics ERP. We understand that the Key characteristics of H VAC ( Heating, Ventilation and Air Conditioning ) industries are ETO and MTO manufacturing scenarios, Contract and pricing mechanism, Project Profitability, Product Configuration, Dynamic BOM generation, Job work, Inventory control and MIS. CorporateServe has covered these important business functions in SAP A1 solution to enable your company manage the entire business better using Project Systems (PS) , Material Management (MM), Sales & Distribution (SD), Finance & Controlling (FICO), Plant Maintenance (PM), Quality Management (QM) and HCM. Textile industry is one of the oldest industries and have seen major technology revolutions from hand looms to state-of-the art weaving and coloring machines. Globalization has led to increase in competition and quality awareness and therefore it has become very important for the textile industry to integrate itself with information technology to survive. ERP is an integrated system that allows information to enter at a single point in process & updates a single shared database for all functions that directly or indirectly depend on this information. Data integration for various departments like sales, accounts, inventory, purchase, production and costing can be managed by the system. Avoidance of duplication of data entry.Sophisticated pre and post production costing mechanism allows to give the right price and track the profits on every order. • Get control of multi-locations data. • Increased reliability of business information. • Reports related to costing, finance, inventory and production are available on the click of a button. We understand key post implementation services to improve usage of existing SAP implementations so that a company can derive maximum value to the investment made in SAP. Corporate Serve has successfully executed following such services for its esteemed organizations. micro soft dynamics ax was originally developed as a collaboration between ibm and damgaard as ibm axapta ultimately acquired by the micro soft corporation in 2002. Before the merger, axapta was initially released in march, 1998 in the danish and u. S. Markets. Today, it is available and supported in forty-five languages in most of the world. ax development and modification is done with its own ide, morphx, resided (until dynamics ax 2012) in the same client application that a normal day-to-day user would access, thus allowing development to take place on any instance of the client. The development language used in axapta is x++. From the dynamics ax 2012 version, development is made using a visual studio plugin. On may 26, 2008, micro soft completed developing (2009) in facilities spanning the globe and including sites in denmark; uk raine and united states. In september, 2011, micro soft announced the release of new version ax 2012 which as of now is the latest version. microsoft dynamics ax is the complete erp solution for enterprises that provides a purpose-built foundation across several industries, along with comprehensive, core erp functionality for financial, human resources and operations management. It empowers your people to anticipate and embrace change so your business can thrive. All of this is packaged in a single global solution giving you rapid time to value. corporateserve being microsoft's gold erp competency complied company, has expertise to deploy microsoft dynamics ax solutions. Corporateserve has successfully deployed ax at several sites including at manufacturing, distribution, real estate and infrastructure companies.